작가에 따르면, 인간은 언제부터인가 초월적인 존재들을 처형해 왔다. 한편으로는 용과 마녀, 악마 등 악신(惡神) 퇴치의 신화, 다른 한편으로는 예수 그리스도와 같은 거룩한 신성(神性)의 몸을 입고 이 땅에 온 존재들-오르마즈드(아후라마즈다)의 예언자로 만족했던 조로아스터로부터 아프리카 오지 원주민의 목각으로 남은 이름 모를 부족신(部族神)까지-에 대한 수난과 박해의 역사가 그것을 방증한다. 인류 역사에서 그런 역할을 해 온 인간들이 바로 ‘호모 엑세쿠탄스’. 이 소설의 주인공 신성민도 그런 인간으로 거듭나는 과정을 거친다. 소위 386세대로 대학 시절 한때 운동권이었던 그는 서울의 한 증권회사 과장이다. 2003년 대통령 선거 바로 전, 동료들과 찾았던 어느 나이트클럽에서 그는 막달라 마리아의 현신이라 볼 수 있는 ‘마리’라는 이름의 여성을 만나고 이후 이상한 일들을 겪는다. 예수 그리스도로 상징되는 보일러공과 그를 따르는 무리들, 그리고 보일러공을 죽이고 세상의 변혁을 주도하려는 정체 모를 시민단체 ‘새여모’의 무리들이 그의 주변에 출몰하며 서로 죽고 죽이는 전쟁을 시작하는 것. 이들이 이렇게 ‘호모 엑세쿠탄스’의 역할을 충실히 이행하는 가운데 주인공은 유대 전쟁사를 또 하나의 텍스트로 끌어 온다. 로마의 압제에서 벗어나기 위한 정치적, 군사적 메시아를 꿈꿨으나 결국 동족 간의 학살로 끝나는 유대 전쟁사를 통한 작가의 비유가 의미심장하다. 작가는 『호모 엑세쿠탄스』를 통해 『사람의 아들』로부터 시작된, 인간 존재의 근원과 그 초월, 해방, 구원에 대한 문제의식을 이어가며 당대 한국 사회에 대한 그만의 성찰을 보여주고 있다. 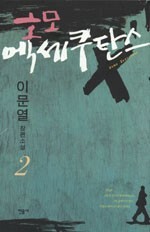 Lee Mun-yeol is one of the best-loved and most steady-selling authors on the Korean literature scene. The 59-year-old however is not new to controversy -- his works have often created a stir. His 1997 novel "Choice" (Sontaek), for example, drew fire from feminists for its apparent defense of the patriarchal and Confucian relationship between men and women. The veteran novelist is hated by progressives and supporters of President Roh Moo-hyun, whom he labels the "Red Guards." Lee defines recent years as "the leftists’ coming out period," during which a "gross Korean-version of a Cultural Revolution has been under way." Lee is a self-claimed conservative intellectual. He tried his hand in politics by working on a screening panel of candidates for the conservative Grand National Party (GNP) during the 2004 parliamentary elections. Now his latest three-volume novel, "Homo Executans," marks a peak in his political statements made through literature. The Latin title places an emphasis on nature of humans as executors, he says. With its plot and through the characters’ narratives, Lee pours out his remarkably intense distrust and detest for the current government as well as what he views as pro-North Korean, nationalistic sentiments among the public. He believes that there is careful manipulation by behind-the-scenes forces. The book’s protagonist, Shin Sung-min, is a disillusioned former student activist and a 30-something stockbroker at a securities firm in Seoul. Through Shin, Lee often voices his own opinion on a range of social issues that emerged in Korea during the early 2000s. The massive crowds’ cheering for the national squad during the 2002 World Cup games, for example, seemed like calculated mass manipulation made possible by "combining the war-like nature of sports games and nationalist sentiments, and mobilizing so-called netizens whose brains go on and off just like digital signals." Weiterführende Links zu "Homo Executans 2"
Kundenbewertungen für "Homo Executans 2"